The Illinois Central Railroad purchased its first "Mountain" type locomotives from the American Locomotive Company in 1923. 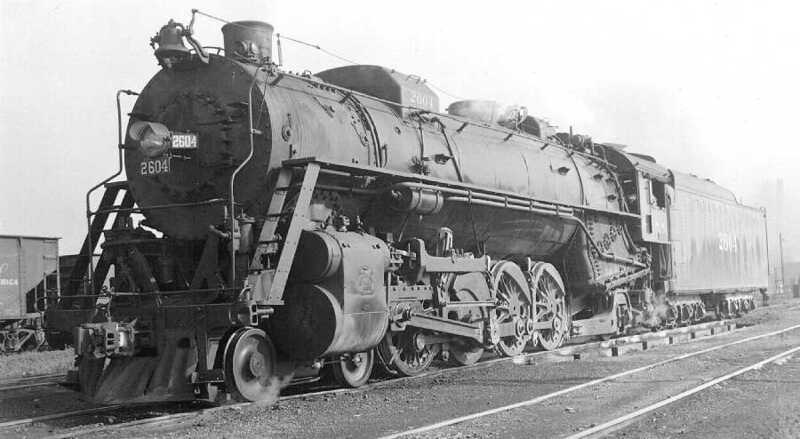 This first order consisted of fifteen (road numbers 2400 through 2414) locomotives which had 28 x 28 cylinders, 73.5" drivers and a 230 psi boiler pressure. They exerted 58,138 lbs of tractive effort and weighed 362,500 pounds. In 1925, the IC took delivery of twenty-five (road numbers 2415 through 2439) more,this time, from the Lima Locomotive Works and in 1926 another twenty (road numbers 2440 through 2459) came from ALCO. These forty-five locomotives were very similar to the fifteen received in 1923, except for an increase of 5,000 lbs in locomotive weight. The Paducah, KY Shops of the Illinois Central built a total of 76 "Mountain" type locomotives between 1937 and 1943. 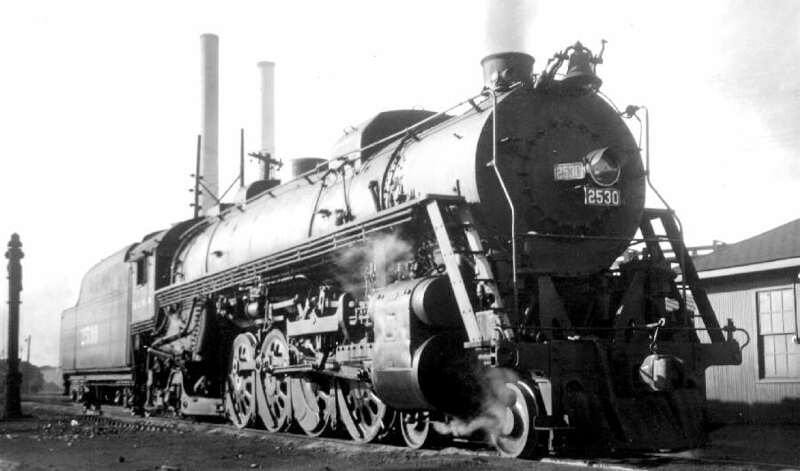 The 2500 series were built at the IC Paducah shops from older IC 2-10-2 boilers originally built by Lima. Number 2613 was used on the L&N Centennial between Louisville and Nashville on Oct 24, 1959. It also ran two excursions out of Louisville to Paducah on May 14, 1960 and to Dawson Springs on Oct 2, 1960. It was kept in the Paducah roundhouse and was in freight service in the Paducah area a few times. It was almost preserved when it was offered (for sale) to the Kentucky Railway Museum. However, the IRM declined the offer and the engine was scrapped. There are two surviving IC "Mountains", number 2500, at a park in Centralia, IL and number 2542 at the IC depot in McComb, MS.
Chris Hohl's data included his compilation of the 2400-series 4-8-2s (Locobase 1356 and 6702) that the big, modern (1927) Paducah, Ky shops rebuilt during World War Two. 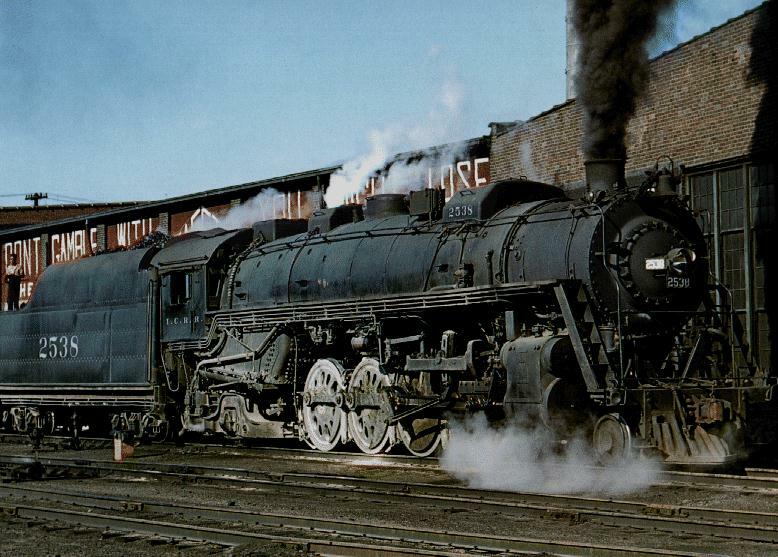 Once modified, these engines and the 2350s shown in Locobase 16033 had the highest tractive efforts of any two-cylinder 4-8-2s. Sometime after the end of World War Two, the 2300s had their boiler pressure setting dropped to 260 psi. All of the 2300s were scrapped in February 1960. Apparently seeking all the tractive power they could generate on an existing Mountain chassis, the IC's shops at Paducah turned out three more conversions of existing 2400-class 4-8-2s in July 1945. Other than the higher pressure setting, the boiler had the same characteristics including 62 sq ft (5.75 sq m) of circulators in the firebox. 2350-2351 were scrapped in October 1956 and the 2352 in January 1957. Data from IC 9 -1928 Locomotive Diagrams supplied in May 2005 by Allen Stanley from his extensive Rail Data Exchange. (Thanks to Chris Hohl for his 11 November 2012 email correcting builder attribution and road number series.) Works numbers were 64569-64583 in 1923. This was the IC's first batch of Mountains and the firebox heating surface included 48.3 sq ft (4.5. sq m) of arch tubes. The subsequent batches -- see Locobase 6702 -- introduced thermic syphons into the firebox. 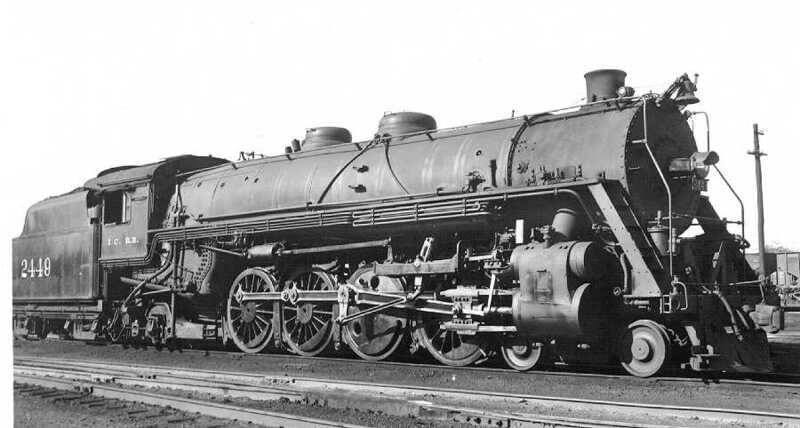 The first fifteen locomotives in the IC's 4-8-2 fleet are described in Locobase 1356. The current record shows the later batches of Mountain. The biggest difference came in the firebox heating surface where the arch tubes were replaced by 115.5 sq ft of thermic syphons. Data from IC 1955 Locomotive Diagrams supplied in May 2005 by Allen Stanley from his extensive Rail Data Exchange. The specs refer to the version that had two arch tubes and four thermic syphons. Together the two types of appurtenances contributed 132 sq ft (12.25 sq m) to the firebox heating surface. The IC took a different path in its development of motive power by rebuilding many of its locomotives. This class is a good case in point. The boilers came from the Lima-built 2900 class of 2-10-2s. Beginning in the mid-1930s, IC Paducah shops took the 2900 boilers, reinforced them, and laid them on a new frame. This engine bed comprised a single casting that included the cylinders and the air-pump reservoir. One by one, beginning in March 1937, 55 of this class were delivered over the next five years. After the rebuilds came the 20 locomotives of the 2600 class (see Locobase 3156), which continued the same design, but were newly built. Data from IC 1955 Locomotive Diagrams supplied in May 2005 by Allen Stanley from his extensive Rail Data Exchange. The specs show the variant that had Type HA superheaters (which had larger-diameter superheater elements); other engines had the Type A that contained 1,242 sq ft of heating surface. These behemoths were among the largest Mountains ever built. They kept the square diameter x stroke dimensions of the earlier 2400s, but increased the size. The firebox heating surface included 83 sq ft (7.7 sq m) of arch tubes (which Locobase considers counter-trending.). The specs show the variant that had Type HA superheaters; other engines had the Type A that contained 1,242 sq ft (115.4 sq m) of heating surface. Like the fifty-five 2500s of the late 1930s, these engines had cast-steel engine beds that included the cylinders and air reservoirs. Unlike the 2500-class engines, which used reinforced boilers from the 2900-class Santa Fes, 2600-2619 were new from the rail up. Offering a prodigious power output on 70" drivers, the Mountains gave good service in freight service of all kinds, according to John S. Ingles (in Drury, 1993), "...even coal trains moved faster behind 4-8-2s than they had behind 2-10-2s."